Glenn and Christine purchased Joe Tomato's in May of 1997. We were at this location on the top of the 10th Street hill in Owen Sound until July 4th, 2002, an eventful day forever embedded in our minds. We woke up to the sound of an explosion in the early morning hours and until the phone rang did we not have any idea that it had anything to do with our restaurant. It was this night that a roof fire destroyed Joe Tomato's along with three other local businesses. Almost a year later, after months of planning and patience, along with the hard work of many local contractors, Joe Tomato's opened its doors at our new location in the Galaxy Centre on June 4th, 2003. The community support that we received after the fire was overwhelming. One example of this involved a small group of young children who organized a lemonade stand at their home. The money they raised was placed in an envelope along with a card and given to us to help rebuild Joe Tomato's. It brought tears to our eyes! Thanks so much to each everyone of our customers who have supported us over the years! What an amazing community Owen Sound is and we are so lucky to be a part of it! 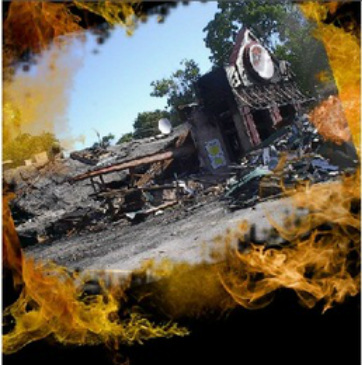 The old Joe's after the Fire!